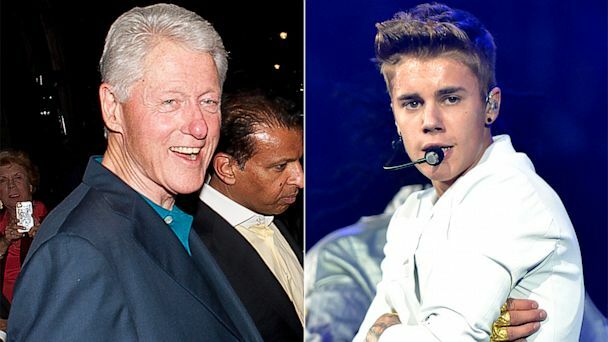 Justin Bieber has made amends with former President Bill Clinton. TMZ released a video Wednesday that showed the 19-year-old singer urinating into a mop bucket before inexplicably lashing out at the former president. After picking up a spray bottle and squirting liquid on a portrait of Clinton, he screamed, "F*** Bill Clinton!" before running away. But now, he's making it clear that he's sorry. "@billclinton thanks for taking the time to talk Mr. President," he tweeted last night. "Your words mean alot. #greatguy"
Bieber's rep has not responded to a request for comment but a Clinton spokesman confirmed that Bieber "did call President Clinton to apologize." Bieber has dealt with his fair share of drama this year. The teen sensation has sparred with paparazzi and his neighbors, including NFL star Keyshawn Johnson, who accused him of driving recklessly through their Calabasas, Calif., neighborhood. But one bright spot? Judging by a recent Instagram photo, he might have reconciled with his ex-girlfriend, Selena Gomez. Beiber last week posted a photo of picture of himself with the 20-year-old "Spring Breakers" actress and simply captioned it, "Heartbreaker."